But developmental theorists have a different way of categorizing parenting style: It splits differences along two gradients, then into four categories. Responsiveness addresses how much attention a parent pays to the child’s needs, demands, and unique temperament. Highly responsive parents attempt to foster individuality and independence by being attentive, supportive, and responsive to the child’s needs and demands. 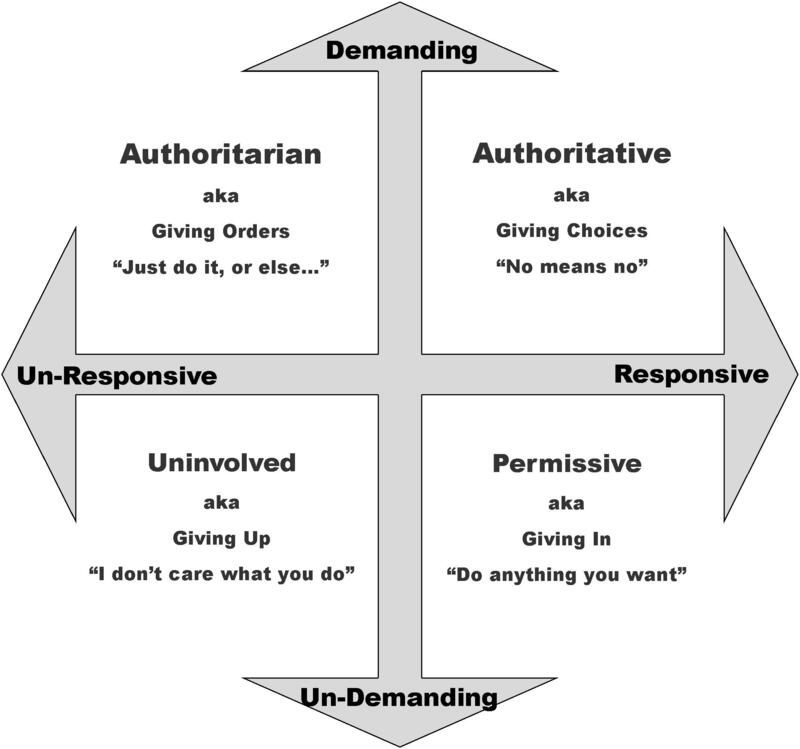 Demandingness, or behavioral control, is how high the parent’s expectation is for obedience and “fitting in” to the social norms. Demanding parents set clear goals and expectations, confront a child who disobeys, and disciplines when limits are crossed. Democratic parents provide clear, reasonable expectations, explain why they expect children to behave that way, and monitor behavior in a warm and loving manner. Mistakes are used as a chance to teach important lessons rather than as an opportunity for punishment. Parents give limited choices based on developmental ability, balancing freedom with responsibility. Children tend to adapt easily to situations that require cooperation. The goal is for children to be self-regulated, self-determined, cooperative, and socially responsible. Focus is on control. Parents provide structured environments, set strict rules, and don’t explain rules beyond “because I said so.” Children may be punished if they don’t meet standards, and may or may not be rewarded when they do. Children are scolded for showing negative emotions. Parents may not show affection. Benefits: Children tend to perform well in school and not get in much trouble, and may excel at skills that require focus and discipline to learn. Downsides: may lack spontaneity, have lower self-esteem and higher levels of depression. Permissive parents have an indulgent laissez-faire attitude. They make few rules and routines, and do not consistently enforce the rules and routines they do establish. They want children to feel free, and have as many choices as possible. They may not have specific expectations for appropriate behavior, and accept their child in a warm and loving way, no matter how the child behaves. Benefits: kids may have high self-esteem, good social skills, low depression, and be creative. Downsides: more likely to show problem behavior, perform less well in school. Uninvolved parents may not give any guidance, punishment, or rewards. They may simply be detached, and un-interested in their children and their activities. Most provide the basic needs of life, but shrug off responsibility for their child’s activities and concerns. In extreme cases, this might include rejection and/or neglect. Children tend to be rebellious, irresponsible, perform poorly at school, and show signs of emotional distress. Here is a free printable handout on this topic of parenting styles. This entry was posted in Parenting Skills and tagged authoritative, discipline, parenting style, toddler on March 25, 2014 by Janelle Durham.